Early the following morning, we made for Crater Lake. We left I5 in Medford, and climbed the 7,000-foot road to Crater Lake. Crater Lake from the Rim Village Lodge I had been there many years ago, as a kid. But I never realized just how incredibly blue it was! Some 7700 years ago, this mountain (comparable in size to Mt. Shasta, still visible, if only barely, to the south) blew its top in an eruption that geologists say made the Mount St. Helens eruption seem like a hiccup: the top mile of the mountain was blasted into the atmosphere, along with pyroclastic matter from a magma chamber below the mountain. What debris that was left slid back into the resulting hole, forming the steep-sided bowl that is now filled with water. Since the lake's only source of water is the rain and snow that falls within the rim, no rivers carry silt into the lake. And since that water is so cold, very little algae grows in it. 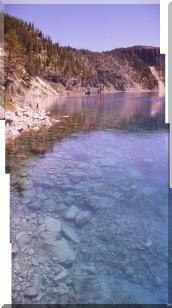 It is for these reasons that the lake is so blue: you are seeing the color of 1900+ feet of almost-pure water.